Chipotle (CMG) is set to report Q1 earnings after the close today (last quarter the co reported at 16:05). The co will host a conference call to discuss later at 16:30. Current Cap IQ Consensus estimates Q1 EPS of $1.29 (vs. -$0.88 Q1 last year) on revs of $1.05 bln (+20% Y/Y). On March 20, shares reached their lowest price during the quarter at 394.19. In the month since, CMG has rallied more than 20%. Short interest has reached its lowest level since June 30, 2017, but short interest still remains high as ~16% of the shares outstanding are short as of March 31. Comps is the number to pay attention to as investors want to know how far along the recovery process the co is. 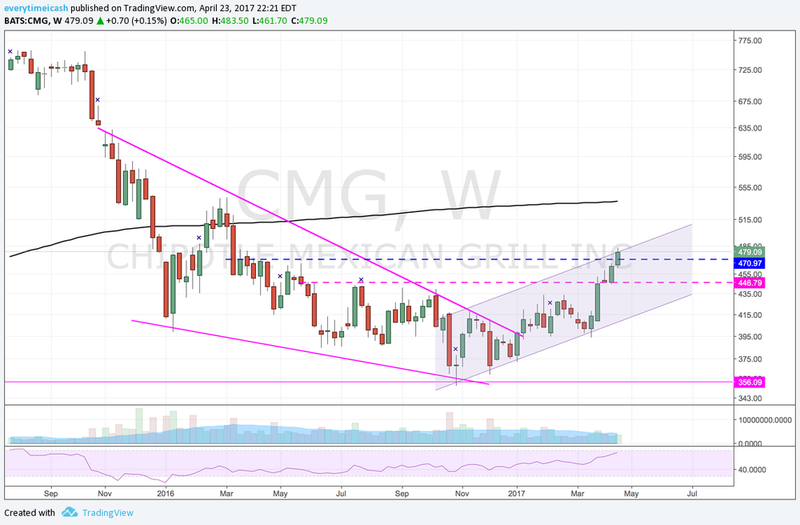 CMG has been grinding higher in a channel ever since it broke out of that two year falling wedge it was in. Currently the stock is sitting near the top of the channel with high ER volatility. I don't expect that CMG will/could say anything that is so abysmal the stock takes a significant dive. However, it is Ackman's core holding so you never know.